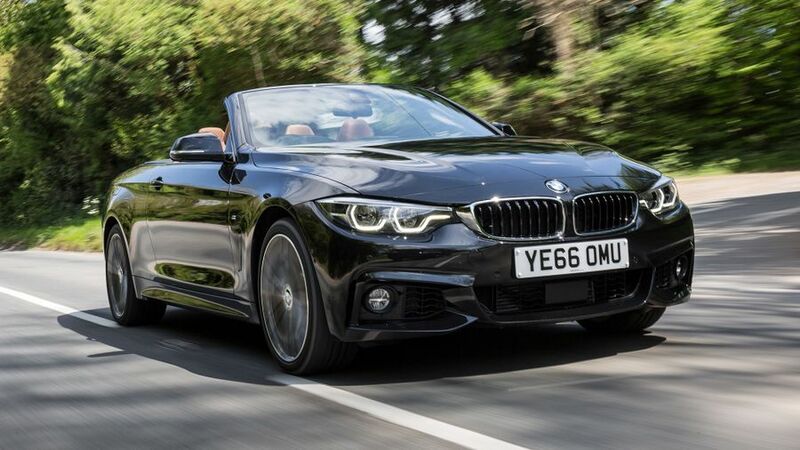 The BMW 4 Series Convertible is more of a comfortable cruiser than a sporting soft-top, but it’s a cracking all-rounder nonetheless. It’s great to drive, classy, and with decent running costs.  If you’re looking for a prestige convertible, it should definitely be on your shortlist. A good convertible, especially one with a prestige badge, needs to convey a glamorous image. To our eyes, the 4 Series has always achieved that. Even when BMW revised the car in 2017, the company made only modest changes to the way it looks, with new bumpers the biggest single alteration. The sleek lines of the 4 Series Coupe are largely maintained up to the rear wheelarches. Behind them, BMW has managed to provide accommodation for the three-piece folding metal roof, without making the rear end look awkwardly high or long, which is no mean feat. 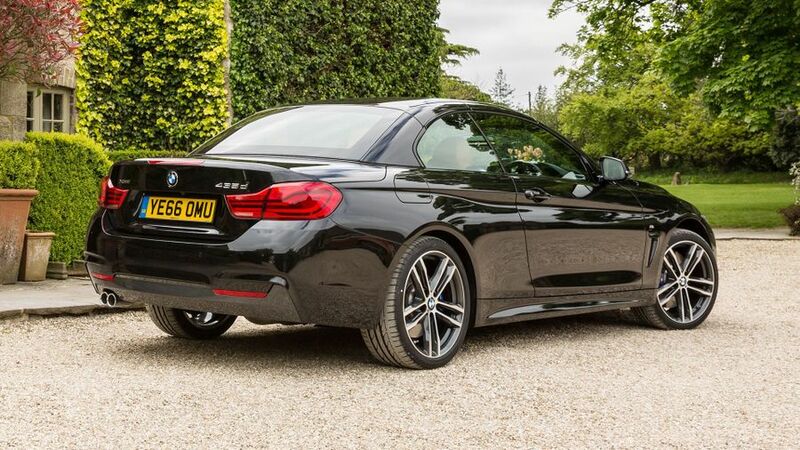 Roof up or down, the 4 Series looks the business. All versions look smart – with alloy wheels and LED headlights standard across the range – but M Sport models get a little more bling than the cheaper Sport-trimmed cars, including standard metallic paint on some of the most powerful cars. 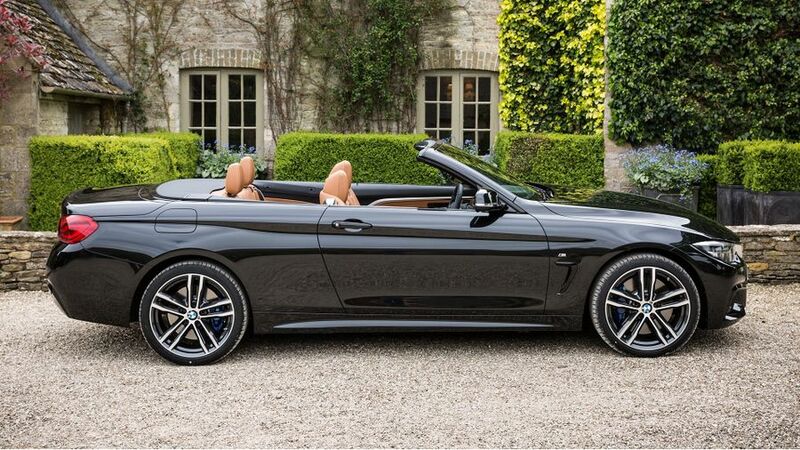 The 4 Series Convertible is every bit as glamorous on the inside as it is on the outside. Just as well, because with the roof down, your cabin is on show. The high-quality materials, finished with metal and high-gloss black details, along with the deftly damped switches, give the interior a real sense of sophistication, and the simple-to-use iDrive infotainment system lends a high-tech feel as well. You can add to this further still by specifying the optional fully digital dashboard. The driving position has lots of adjustment to help you get comfy at the wheel, but the slightly offset pedals are awkward (especially on models with a manual gearbox), and the rear view could be better with the roof up, too. 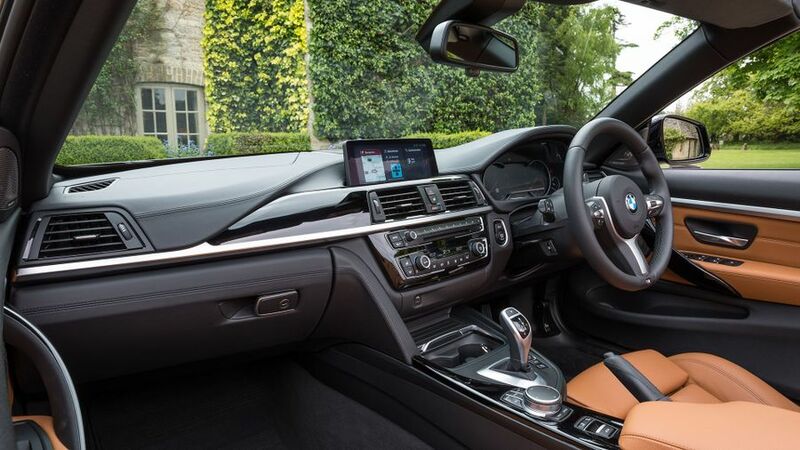 Unlike many four-seat convertibles, the 4 Series’ cabin has enough room for four adults to travel in reasonable comfort. Leg-room is adequate in the back, and with the roof up, so is head-room. The boot is fairly tiny with the roof down (just 220 litres, and there’s a very narrow gap to load items through), but it’s an impressive 370 litres with the top in place. And let’s face it, with UK weather being what it is, that’s where the roof will stay most of the time. 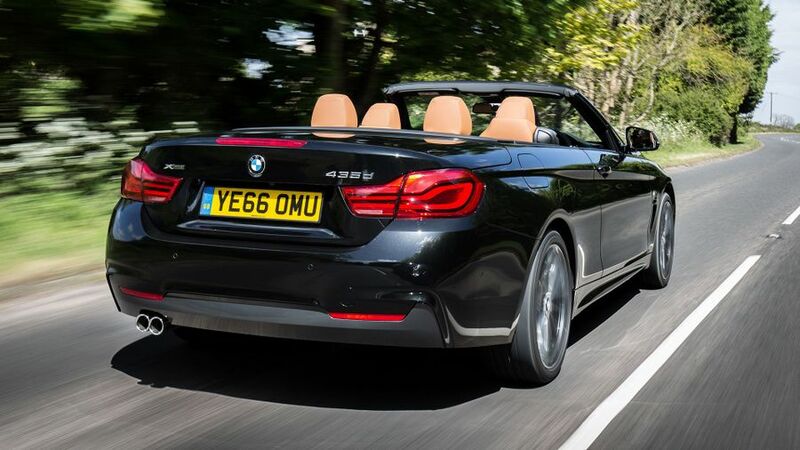 So far, we’ve only sampled this latest 4 Series Convertible with four-wheel drive and the optional Adaptive M Sport Suspension, which uses adaptive dampers to alter the car’s characteristics, depending on which of the four settings you choose. That said, no matter which you go for, the suspension delivers a pretty comfortable ride most of the time, with only the very nastiest potholes giving you a whack in the backside. Things don’t tighten up quite as much as you might expect in the sportier modes, and you still feel a fair amount of roll in corners. However, that roll is well controlled, and thanks to the responsive, accurate steering, and a tremendously balanced and composed feel through the bends, this is a properly enjoyable car to drive. Admittedly, it’s not quite as sharp as a genuine sportscar, but that sure-footed feel means it’s very easy to keep up a sportscar-like pace across country. When you find yourself on a less demanding main road, it all feels beautifully smooth, and more than capable of traveling long distances in complete comfort. Three petrol engines are available in the open-top 4 Series: the 420i has a 2.0-litre four-cylinder turbo with 181bhp; the 430i has a 248bhp version of the same engine; and the 440i is powered by a 3.0-litre six-cylinder unit with 322bhp. We haven’t yet had the chance to try any of these, but we have tried the most powerful diesel unit: the six-cylinder 435d with more than 300bhp. This comes exclusively with four-wheel drive and an automatic gearbox, but don’t go thinking such a combination will slow this thing down. On the contrary, this is a very quick car. It has so much pulling power from just 1500rpm that it gathers speed really quickly, and with precious little apparent effort. General refinement is pretty good, too: road-noise is well suppressed; there’s very little buffeting in the cabin with roof down and the wind blocker in place; and, when you raise the metal roof, there’s not much more wind-noise than in your average saloon car. The 4 Series isn’t a cheap car, but then again, you wouldn’t expect it to be. Importantly, it’s priced competitively against its major rivals from Audi and Mercedes, and it’ll hold its value just as well as either of those rivals, too. Unsurprisingly, it’s the diesel-engined 420d that leads the way for fuel economy and emissions, and the official average figures of 55.4mpg and 134g/km are pretty impressive. What’s more, although they’re thirstier, the petrol engines also compare well with their similarly powered counterparts from Audi and Merc. The quality and attention to detail with which the 4 Series is assembled should give you plenty of confidence in how well it’ll last, but some reports paint a slightly different picture. BMW currently languishes well down in the bottom half of Warranty Direct’s manufacturer standings, for instance, and some owners (although, admittedly, a minority) of the pre-facelift 4 Series have reported problems. The 4 Series – in any form – has not yet been crash-tested by the experts at Euro NCAP. However, the 3 Series saloon, with which the 4 Series shares most of its mechanicals, has achieved the full five-star rating, albeit under regulations that are less stringent than today’s. Standard kit includes a stability control system and six airbags, and there are many more safety measures available on the options list, including a Lane Change Warning system (warning of traffic in a blind spot when changing lane), adaptive cruise control, and the Driving Assistant Pack, which includes Lane Departure Warning, Forward Collision Warning, and City Collision Mitigation (autonomous braking). 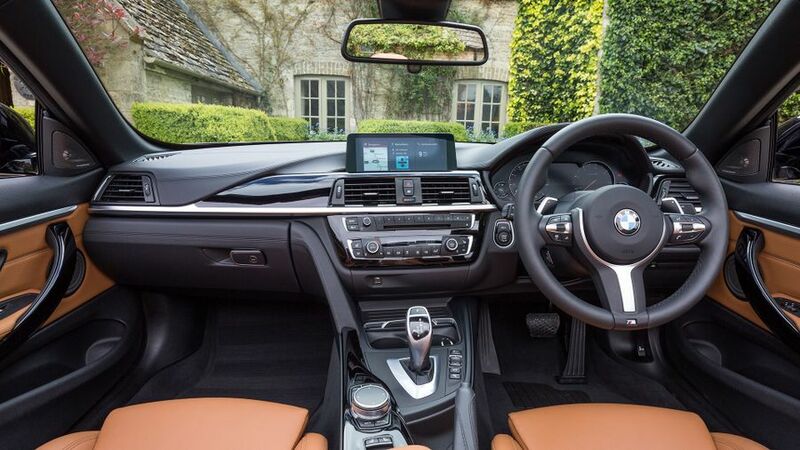 There are just two trim levels to choose from – Sport and M Sport – and all are well equipped, with front and rear parking sensors, heated front seats with part-electric adjustment, leather upholstery, dual-zone climate control, cruise control, sat-nav, Bluetooth, and DAB radio as standard. The biggest differences if you opt for M Sport are aesthetic – different trim inside and out, primarily – but you do also get the upgraded ‘Professional’ infotainment system. Beyond that, there are plenty of options, covering everything from the way the car looks, to its connectivity, technology and comfort. Quite simply, because it’s one of the best cars of its type, being competitively priced and affordable to run. It might not be the car you expect – being more of a cruising convertible rather than an out-and-out sportscar – but it has plenty going for it nonetheless.